I have gone through my fair share of soccer balls. I juggle them with my feet, kick them around on paved surfaces and against walls. I am not kind to them! This kind of rough friction is very hard on soccer balls. I usually have one brand new or nearly new ball in my possession and one or two oldies. I prefer to use the oldies because the brand new ones are very smooth and slippery. The older ones are usually a bit softer on the foot as well. My good friend Dave is really into volleyball and is pretty picky about purchasing balls. I can attest that money is well spent on a good volleyball. In other words, you generally get what you pay for, and some cheap volleyballs are nearly unusable. Back when Dave and I peppered around and played a few informal games, I realized this sensitive threshold between a good volleyball and a bad one. There was pretty much one brand that was the best, and all the others were far inferior. Fortunately with soccer balls, you don't necessarily get what you pay for, at least this is what I have found. My opinion doesn't count for much though because I never use them in gameplay. I only juggle. But I might argue that a good ball for juggling is also probably good for games. It might be my imagination, but I have found almost the opposite rule from the volleyball discussion. The cheaper the soccer ball, the more I seem to like it. Some of the cheapest balls are the most consistently made - very round and not too bulgy. Since most standard soccer balls will not last forever when used on rough pavement, there is no particular reason to buy an expensive one. I am rough on them, so the cheaper the better. After all, I am not thrilled about an annual "soccer ball budget" that buying more expensive balls would require. I buy soccer balls at Target, Ross, Walmart, or occasionally Big 5. I rarely pay more than $10 or $12 for a ball. I am not very materialistic, so I don't care about looks, colors or brands. I can generally tell at a glance if a ball will work for me or not. I do tend to like Adidas soccer balls, as they are especially consistent and smooth in contour. That said, I have never bought a total dud, no matter the brand or price. My last post about Richard Swanson inspired me to investigate his vision a bit. The primary organization he was raising money for is called The One World Futbol Project. I haven't read all the details, but the basic idea of their charity is to donate high quality soccer balls to people in areas of the world where affordable access is lacking. A soccer ball can literally be a person's dream come true in many countries. Trust me, I know! Have you ever seen those photos of kids with bundles of garbage packed together as a soccer ball? National Geographic even did a story on innovative children and their homemade soccer balls from all over the world. I have seen such balls first hand in poor communities in Brasil! Kids cannot afford a real ball, so they make one by packing and binding trash or other materials using twine or whatever they have handy. If they have access to a real ball, they will repair it many times before getting rid of it, long past what most westerners would consider acceptable for use. Soccer is the primary activity or sport for kids in many nations, and a good ball is hard to come by, especially if you are poor. The balls that One World Futbol produces are supposedly "nearly indestructible." That is a claim I am WAY TOO CURIOUS to simply read about. It requires tactile feedback. Even though the One World balls are more expensive than what I normally buy, I cannot resist checking to see if their claims are true. They say that one of these balls can outlast thousands of regular balls! Whoa! That would mean I would never have to buy one again! We'll just have to see about that. Even if it lasts 3 or 4 times as long, it will pay for itself. 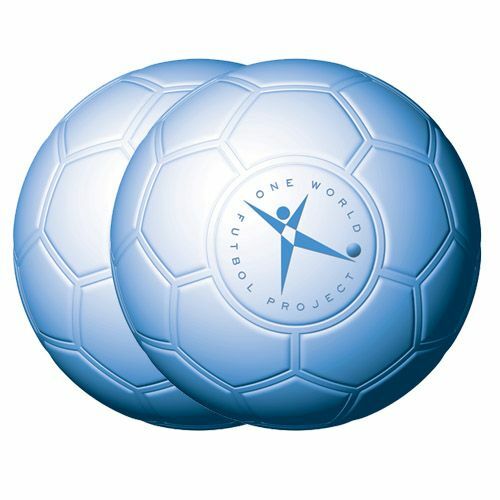 The cool thing about purchasing these particular balls is that "for every One World Futbol you buy, we give a second ball to a community in need through organizations working in disadvantaged communities such as refugee camps, war zones, disaster areas and inner cities." I like that idea. Totally going to buy one. I'll try to be gracious in my assessment of the ball when it arrives. I don't want to get my hopes up that it will be truly invincible. I have a hard time believing that. More importantly, I hope that whoever gets the other one (I buy one, someone else gets one free) will get some good use out of it. And you have to know that if one kid has a ball, it means a whole group of kids will benefit! Sweet! P.S. Thanks again, Richard Swanson. You got me blogging again! I can't say that it is very rewarding as far as interaction. People don't read blogs much since the advent of Facebook and other social media. But it is rewarding for my own personal processing and growth... as long as I don't waste too much time on it.